London has traditionally had very few places that you get a good look at her from high up. Primrose Hill is probably the most famous vantage point for a wide panorama and Tower Bridge a good spot if you wanted river views. 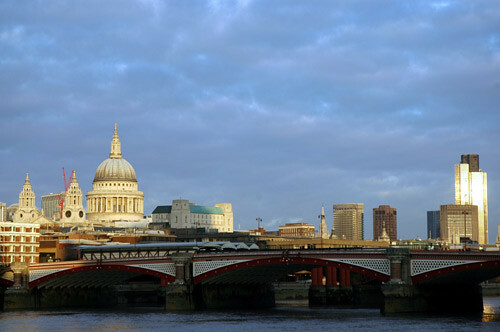 These days, of course, we have the London Eye and for the more gastronomically minded the Oxo Tower, and what a view it is; a majestic sweep down river with St.Paul's Cathedral bang in the middle and then veering off to the battle lines of re-generation with the Gherkin as the battle standard. The perfect place for a buzzy fun lunch with a romantic edge. We got to the Oxo Tower Brasserie (as opposed to the Restaurant) this afternoon and it was absolutely rammed, the wait staff slightly de-mob happy and looking forward to their works Christmas party. Not the best omens for a successful pre-Xmas lunch. I needn't have worried too much, the crowd was pretty good natured and our waiter a charming combination of public school boy and tattooed biker. It is a bit cramped in the brasserie at Oxo tower I don't mind saying, they probably refer to it as intimate in the literature but they could do with spacing the tables a bit more, if only for the poor bloke on crutches at the tables next to me. 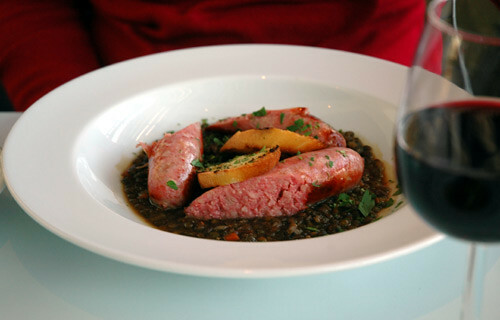 This Toulouse sausage with lentils was probably the stand out dish of the meal, along with the osso bucco gnocchi I had to start. But it has to be said the food it almost secondary here, you certainly not paying just for the pleasure of eating it. You paying for the view to a certain extent, and I have no problem with that. The foods a good modern take on brasserie classics and more than competent, so you can sit back and not worry too much about the grub enjoying the sunset over St.Pauls. P.S. Merry Christmas, have an excellent day everyone! Oh, bra humbug! I'm sure you'd rather eat at a brasserie. I think I would. hahaha, I was in a bit of rush and didn't notice what word spell check had done to that post.